Sometimes when you take a shot you never know how important that image will be. This old barn used to be a church years ago for summer camp kids. Now a development is gowing up all around. The brick house you see a corner of in the background currently has a white fence and a big propane tank. It is almost impossible to get a clean shot of this building now. I will post several other images taken in the summer and winter. It is interesting to try and get a different perspective each time you shoot. When I get them posted, see how many other shots are of this barn or the red brick house behind it. Great shot ! Fantastic light ! I love this shot.The rich colors....the light/shadow play.Beautifully taken...3rd's schmurds! it's the autumn I most look forward to. great warm atmosphere and radiant colours. Astonishing image! The light, the colors and composition are perfect! V! Aaah, can't get any better than that. A wonderful image! Development around the country (and the world) has simply run out of hand for the last few years. In a way, thankfully this is probably about to stop. Amazing. Wish I had your talent. This is one of the best images I've seen and the story behind it makes it all the more special. Wonderfull play of sharow and light. I love the angle and colors.Voted. Spectaular shot. Great lighting and setting. Looks like a great painting. Fantastic light but I wish the image was a bit bigger. This photograph is just breathtaking ! wow, what a beautiful capture, love the backlihghting and the colours. Absolutely beautiful image, Fred. Glad you carght it before the progress sets in. An excellent picture with superb lights, shaddows and colors. It could be even better if you turned the camera a littel bit to right or left and placed the church not in the middle of the picture. Hi Fred. Beautiful light accentuates a terrific architectural capture within the fall landscape. Nicely done. Best regards, Michael. The colours are amazing. Almost like in a dream. very very cute picture ! she really give me the longing to visit your state , I already visit your country but always on the west coast... maybe next holidays ...great work.. Thanks Matt - this is a very popular image. The colors in this photo are absolutely stunning! Re why so small . When I first started posting to pbase I was paranoid my images would be stolen. And now I make them larger and have not gone back and redone them. However, I have found some were ripped off for use on websites etc. sad to say. Beautiful light ! I sure would love to visit New Hampshire in the fall. Can't say enough about this one. Excellent capture Fred! I second Roberta. 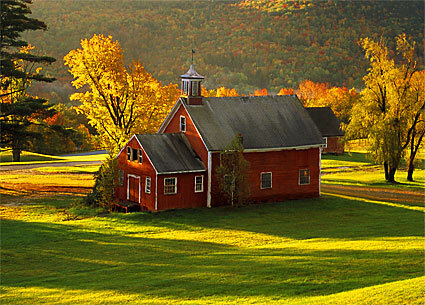 The lighting is what really makes this image, especially the illuminated tree with fall foliage behind the barn. What an idyllic scene! I love the vantage point from just above the barn, too - makes it a little different from most New England barn scenes. Voted again! The lighting is just stunning! This is so beautiful. Very well done. oh my this one is it!!! magic and lumionessness and peace and old new enland pride and beauty... VOTED!!!!!!!!!!!!!!!!!!!!!!!!!!!!!!!!!!!!!!!!!!!!!!!!!!!!!!!!!!!! Thanks Christopher for your kind words. Just added a new gallery "Canyons" with the lead shot taken today. This image is so full of mood because of the leaves and the surroundings. It's as if that old church is suppose to be there and nothing else.